The 10 Best Cross-Country Skiing Trails in California! Cross-country skiing may not have the same showy appeal of downhill skiing, but more and more people seem to be taking up the sport. California offers numerous spots for cross-country skiing, which is more intuitive and less reliant on lessons than downhill versions. Check out some of the best cross-country skiing trails in California, which are suitable for all ages and levels of skiers and allow you to enjoy your natural surroundings. The Auburn Ski Club offers memberships so that you can enjoy a variety of winter activities, including cross-country skiing. But the real draw is the programs, which are for a variety of ages and events that bring you together with other skiers. Formerly known as Badger Pass, you can rent cross-country skis and explore several different trails ranging in size from a few to many miles as well as check out other winter sports and special events in the expansive area. Bear Valley features an expansive trail system with over 30 trails to explore the snowy regions between wilderness areas. There’s a café, rental options, stuff for kids and places to stay so that you can take full advantage of the snow season. Big Bear Mountain’s pine trees are best enjoyed via cross-country skis. The mountain resort is filled with family fun, including adventures through pines on maintained trails. Boreal Mountain Playground offers numerous winter activities along with a village, après ski events and adventures and a plethora of ways to enjoy the various terrains that make up the expansive resort area. Caples Lake Resort is filled with cabins and accommodations to enjoy the nearby cross-country trails of Kirkwood. 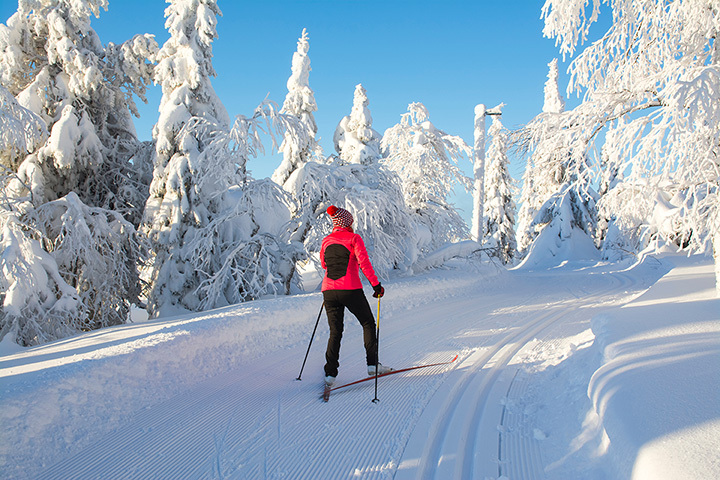 Cross-country skiers are encouraged to wear layers to explore groomed trails, service roads, summer trails and other wintery wonderlands. One of the oldest resorts in the area, Donner Ski Ranch is the second largest ski resort area in Donner Summit. It’s beautiful and attractive and offers discount days and special price breaks in an effort to get more people skiing. The Montecito-Sequoia Lodge is open year-round but during the winter, the all-inclusive resort turns into an old fashioned wintery paradise complete with buffet meals to fill up on after a day on the cross-country trails that offer breathtaking views of Kings Canyon and Sequoia backcountry. Located in the San Bernardino Mountains, Rim Nordic Ski Area is a convenient location that offers groomed trails for easy adventuring. Look for trails for skiers of all levels and are clearly marked for safe skiing. Tamarack Lodge offers the opportunity to head out the door on your cross-country skis to explore the wilderness. When you tire of the outdoors, head back for a cozy meal at the Lakefront Restaurant or have a cup of coco on your log cabin deck. View more California Cross Country Skiing Trails.